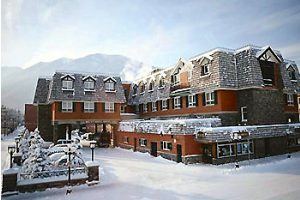 The Banff Mount Royal Hotel features 135 tastefully appointed rooms, as well as suites for extra luxury and privacy, or deluxe suites boasting jetted bathtubs, fireplaces, and large screen televisions. These guest rooms offer contemporary comfort in downtown Banff. Most importantly, you will enjoy unbelievable mountain views out your window. Tony Roma's is located just off the Lobby of the Mount Royal Hotel. A high end casual American restaurant chain and the pioneer of baby back ribs - this Tony Roma's also specializes in AAA Alberta steaks and slow roasted BBQ chicken, beef and pork. The Paddock is a good old Canadian Pub, perfect for sharing food and stories. A great place to please everyone. Enjoy your favourite cocktail, sample the best burgers in town, catch the game on the big screen TV, play darts and pool. Children are welcome on the restaurant side of the Paddock.